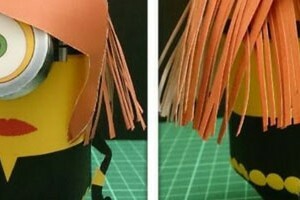 Another minion paper craft creation from Rickie Yeung. 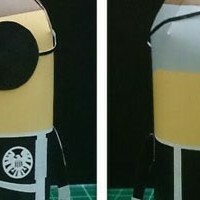 Now he made the agent of SHIELD, Nick Fury minion. Nick Fury appears in many Marvel movies, in Avengers, Captain America, Iron Man, etc. In Avengers movie Nick is played by Samuel L Jackson. The templates consist of 2 pages of patterns, very simple one. 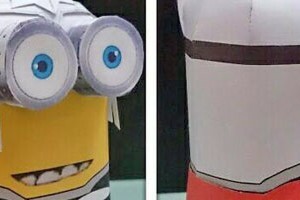 It looks like the minion paper craft modification didn't stop just on Avenger characters, because Rickie still submitting new ones. 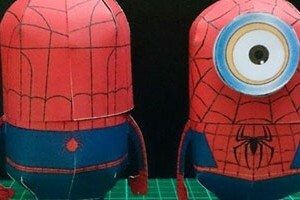 This time he created a spiderman, spider-minion :). There are 4 pages of patterns in the template. This template is different, not like as usual, Rickie made 5 alternatives style for your Spider-minion model. You may choose the Spider-minion who open his mask, or wear the mask and other alternatives using glasses or without glasses. 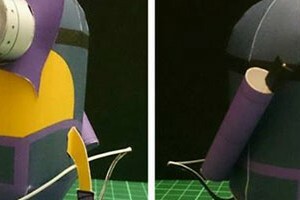 Finally Hawkeye minion joined the minion-avenger club. This template was submitted by Rickie Yeung from Hongkong. Previously he also submitted Thor minion template. This template only consists of 2 pages of patterns, including his mask, bow and arrow case tube. You can use toothpick to make the arrows, or you can improvise using other material. The scale also already matched with Thor and the original yellow minion. Still needs black widow minion to complete all minion Avengers. One more Avenger character added to the custom minion templates. This template was submitted by Rickie Yeung from Hongkong, he modified yellow minion template into Thor minion. He use texture from Thor paper figure template designed by Christopher Ryan from Bamboogila's Corner, which also hosted here in Paper Replika. Rickie missing something here, Thor's hammer. I already added a simple hammer pattern in this template. Photo and build by Rickie Yeung.